The Kona Big Unit is a frame that Kona has specifically engineered and refined, based on rider input, to provide some of the best features that contemporary mountain bikes have to offer. This custom spec'd Kona frame is one of the nicest custom rides to grace our sales floor. It all starts with Kona Scandium 6069, which is boasting about 40% higher yield strengths than previous Kona Scandium alloys. Strength to weight ratio is reduced greatly, creating a super-light, strong, tight-handling, stiff frame. Added to that, are great frame features like a tapered headtube with a zero-stack headset, which strengthens the front end of the bike, giving you that 'point and shoot' feel that improves the bike's handling and inspires confidence in its rider. The Big Unit also has a compact rear triangle. Short stays improve the handling characteristics of the 29" wheels, for better traction, acceleration, and tight-handling in switchbacks. The sliding rear dropouts are 12x142 thru-axle, with four 6mm bolts, and allow the use of a derailleur, or single speed set ups. The compact rear triangle and the 12x142 thru-axle on a hardtail mean all out trail handling performance like you have never known before. An X Fusion Slide 29 fork w/ 140mm of travel and Stan's ZTR Arch rims on SRAM X9 hubs compliment the ferocity of the frame. 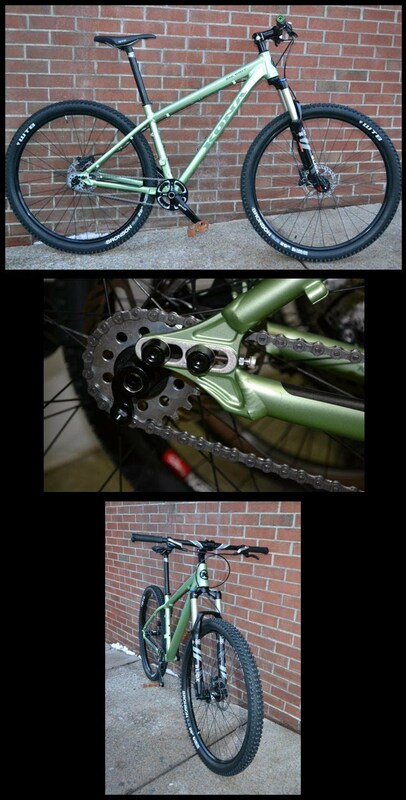 TruVativ Stylo single speed cranks and a Surly 20t cog make for a solid, dependable drivetrain. Its not an over-the-top build, but the bike weight came out to be only about 24.5-lbs. This bike is capable of tackling anything you can ride. Geared or single speed, with 140mm up front, an ultra stiff, lightweight frame with excellent handling characteristics, and a parts package that will never let you down.